Nestled deep in the Andes, the former Inca capital city of Cusco stands at 11,152 feet (3,399 m) above sea level. It is a destination for tourists from around the world who ascend the treacherous mountainside roads to make their pilgrimage to one of the modern wonders of the world, Machu Picchu. While it is best known for its proximity to the ancient city, there is a wealth of other sites in and around Cusco that still have intact remnants of the region’s Inca past. 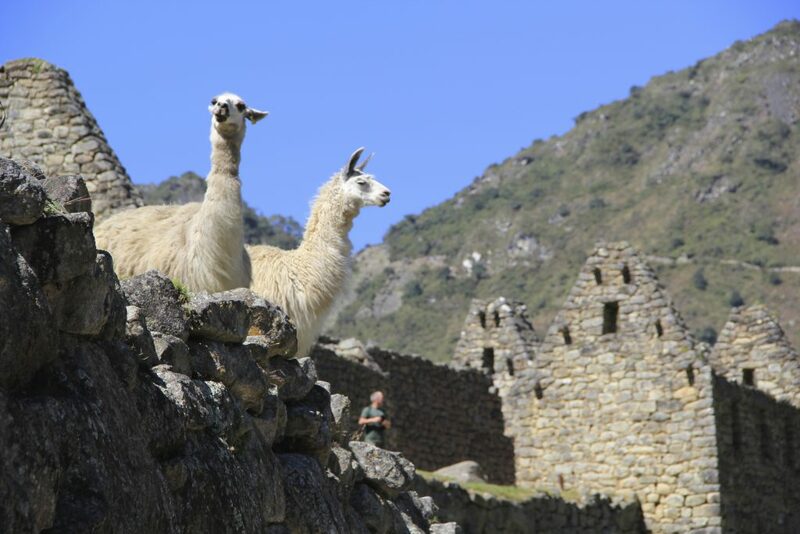 Two llamas on a surviving stone structure at Machu Picchu. Photo © Caroline Cervera. The Cusco Cathedral during a festival shortly before the winter solstice. Photo © Caroline Cervera. The Inca Empire, known to themselves as Tawantinsuyo, began in the early 15th century and lasted until the Spanish conquest. 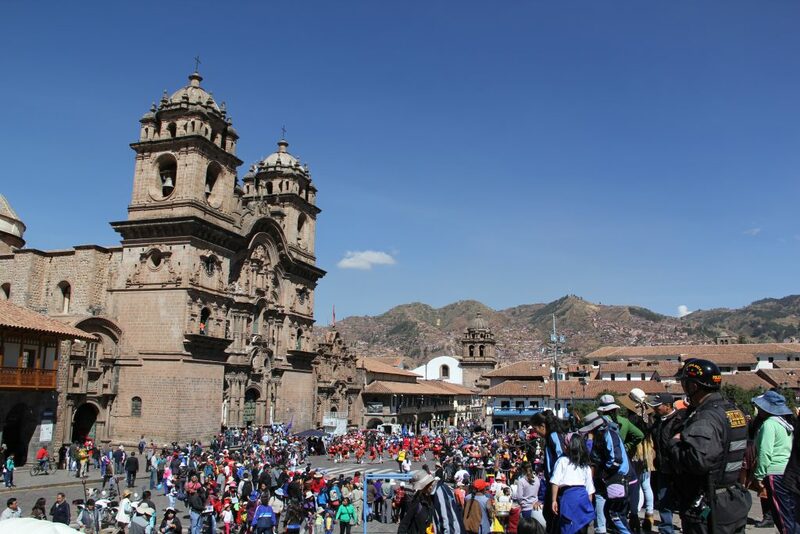 It was centered on the capital, Cusco, which continues to be an important city in Peru. The government was a hierarchal one, ruled by the Sapa Inca, a monarch with absolute power. The Incas also had a polytheistic state religion that revered the sun as its supreme god, Inti. Western South America is located on the “Ring of Fire,” a term for the geological frontier between the Pacific Plate and several surrounding tectonic plates that receives a significant amount of seismic activity. Inca architecture demonstrates that the Incas were well aware of this fact and invented ways to combat it. 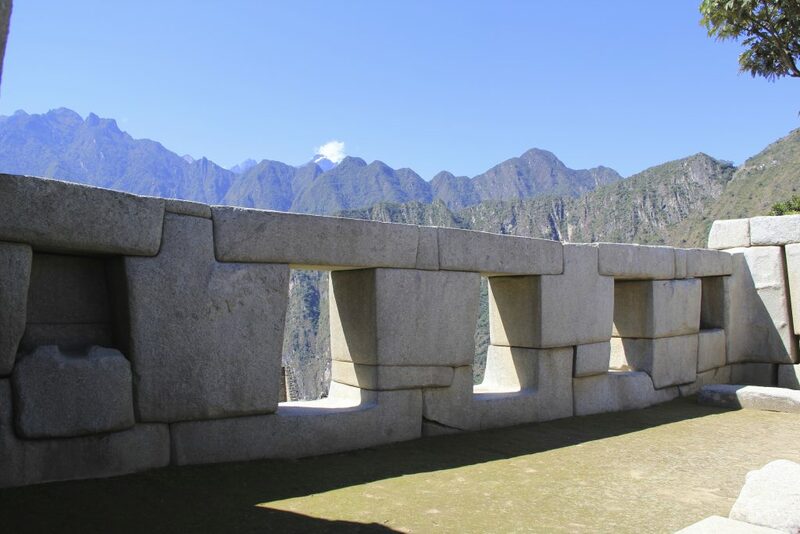 Inca stone architecture features massive blocks of stone that perfectly interlock with each other. The blocks are so tightly and precisely locked that not even a razor blade can fit between them. Megalithic Inca architecture at Sacsayhuaman, located in the hills above Cusco. Photo © Caroline Cervera. 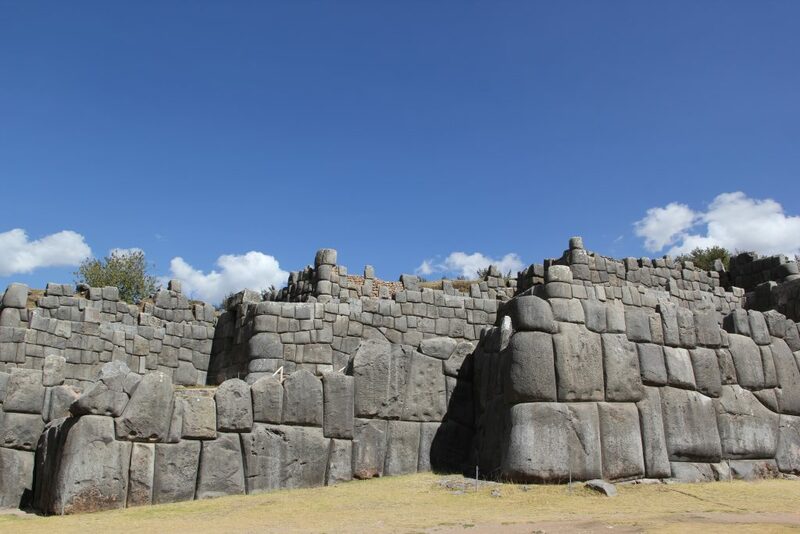 The Incas moved stone blocks up to 120 tons (109,000 kg) to create these structures at Sacsayhuaman, all without knowledge of the wheel or access to pack animals besides the llama and alpaca. Instead, it is theorized that they used a proto-wheel by rolling them on large mats of logs. 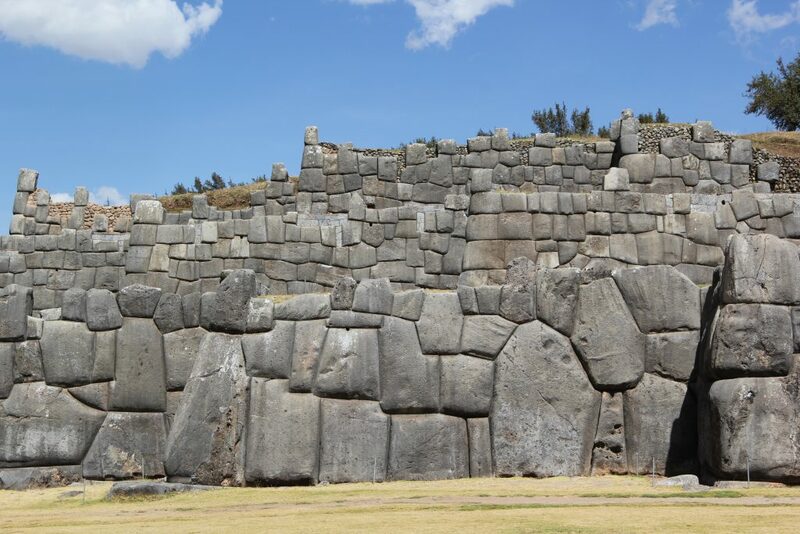 The Incas moved these massive stones to Sacsayhuaman to create this structure located in the hills surrounding Cusco, their capital. Photo © Caroline Cervera. This method of constructing buildings made them highly resistant to earthquake damage, as the stones moved in place but did not fall entirely the way other building materials might. Some early colonial authors wrote that the stones “danced” during seismic activity. The stones would move but could easily be put back into place. These stones at Machu Picchu have survived over five hundred years of earthquakes keeping their basic structure without maintenance, providing a snapshot of what an Inca wall might look like after a 15th century earthquake. This wall at Machu Picchu has mostly survived despite the obvious seismic activity. It would have been easy for the Incas to rebuild the wall after an earthquake due to this architectural structure. Photo © Caroline Cervera. Imagine standing up with your feet together. If you were pushed over, you would almost certainly topple down. However, stand with your legs much wider than your shoulders and you will be much more resistant to force. This is a similar principle to that of the Incas’ trapezoidal buildings, which featured walls and windows built on an angle that provided resistance to force. 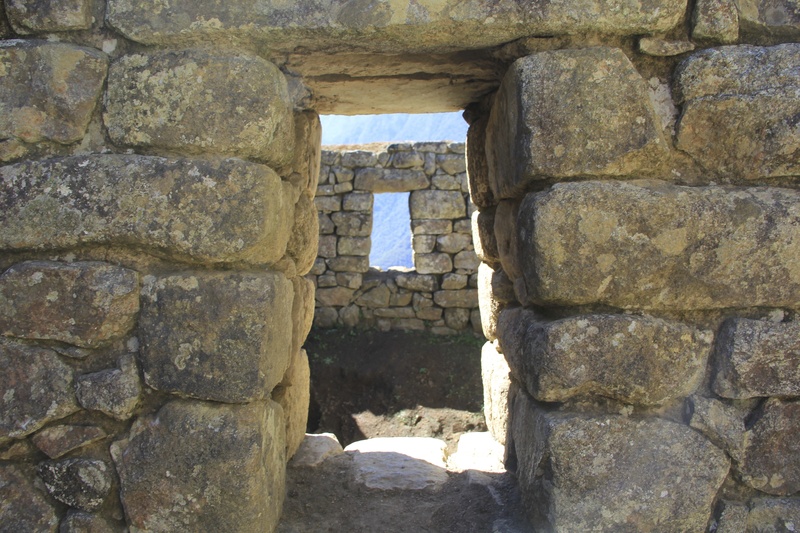 The windows of Machu Picchu seen below are typical of Inca structures, having a wider base than top. These trapezoidal windows overlook the steep mountains surrounding Machu Picchu. Photo © Caroline Cervera. Similarly, the angle can be seen in the wall of this building. In an earthquake-prone region like the Andes, this feature is invaluable. 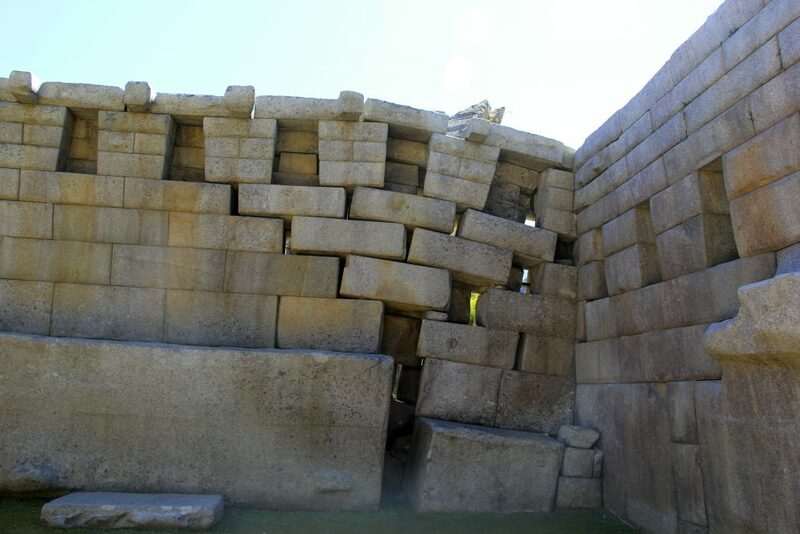 This wall built using the trapezoidal principle still stands at Coricancha, an Inca temple of the sun in Cusco. Photo © Caroline Cervera. The room above is at Coricancha, a temple which was partially destroyed by the Spaniards after their conquest of the empire. 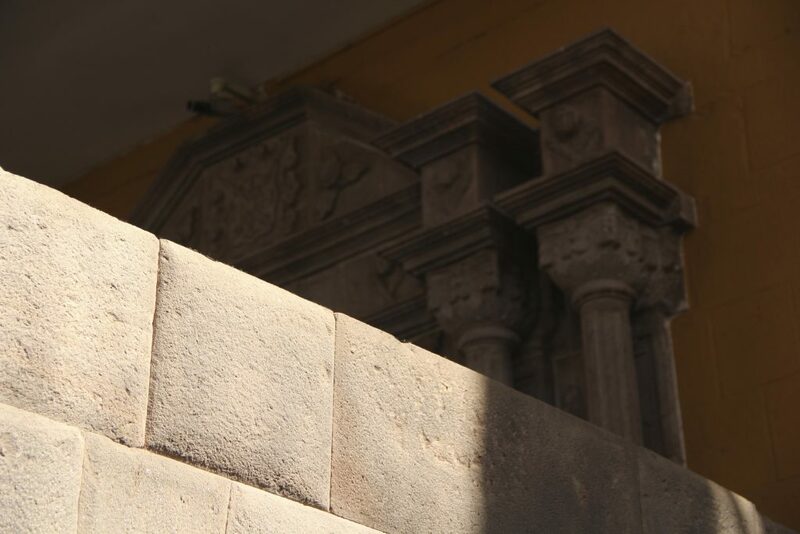 This temple dedicated to Inti, the Inca sun god, became a Catholic cathedral to assert Spanish dominance over the local population. The juxtaposition of the Spanish and Inca architecture can be seen here, showing how the two vastly different cultures met and clashed during the 16th century conquest and colonial period. 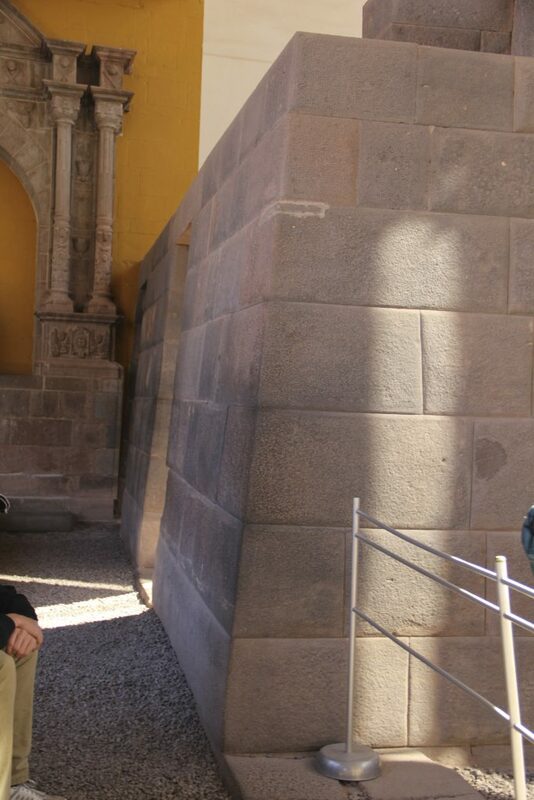 Inca and colonial architecture side-by-side in Coricancha. Photo © Caroline Cervera. 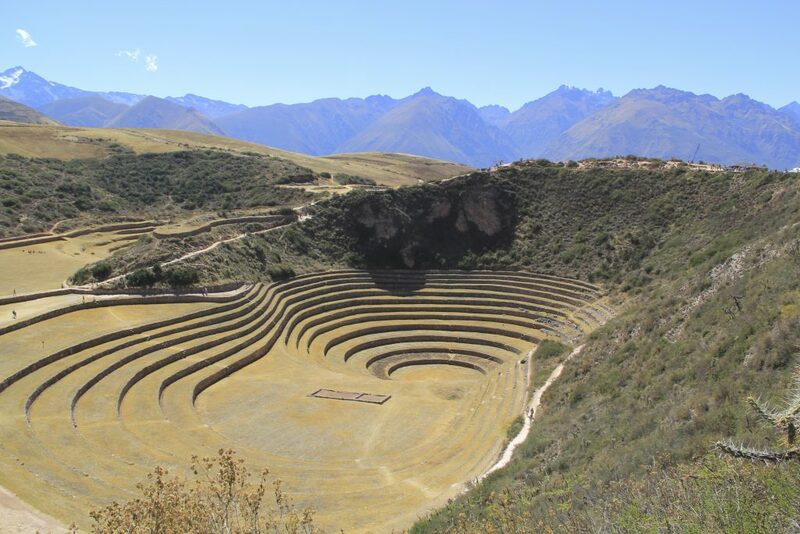 This terraced, circular structure was the site of an early open-air agricultural laboratory and perhaps one of the Incas’ greatest inventions. At its height, the Inca Empire encompassed an estimated 12 million inhabitants from the coastal desert to snow-capped mountains. This called for an immense amount of agricultural engineering to feed the population, some of which took place at Moray. 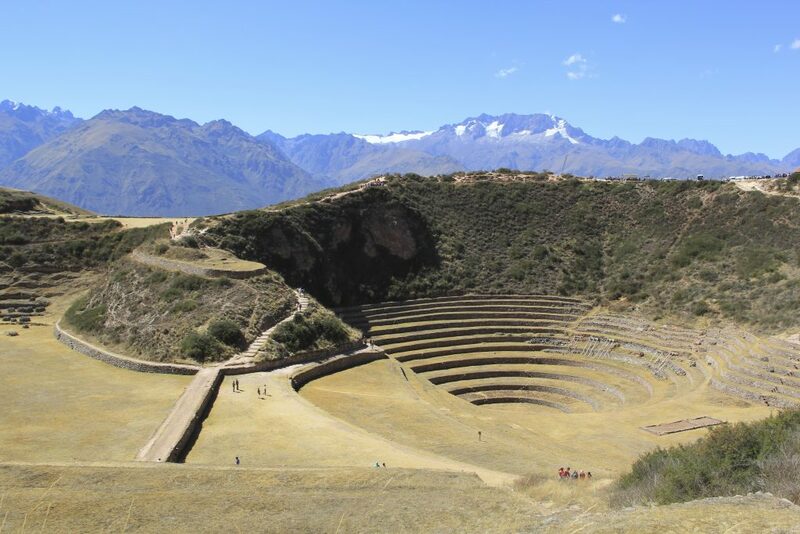 Maras Moray, a site of immense innovation and creativity, is located high in the mountains of Peru. Photo © Caroline Cervera. The site lies at approximately 11,600 feet above sea level (3,534 m) and the entire complex spans approximately 400 feet of altitude. As a result, the climate varies significantly between the top and bottom level. Visitors can feel the difference in their bodies as they move up and down the structure. The Incas would plant a new crop, such as maize (corn), at their native altitude and allow them to breed for some time. Glaciers lie in the distance behind the Inca agricultural laboratory at Moray. Photo © Caroline Cervera. Once they adapted to that altitude, they would move the crop up to the next level, where it would spend time adapting to the new climate. The process continued as it moved up the mountainside and ascended up to 400 feet. Such innovation shows a remarkable knowledge of agriculture, architecture, and engineering. The effects of such agricultural ingenuity are seen today in the thousands of thousands of varieties of corn, potato, and other agricultural products that continue to be staples of the Andean diet just as they were during the Inca period. Many thanks to the fantastic and informative Abrahan Quispe Corrales, my guide in Cusco and the surrounding area.